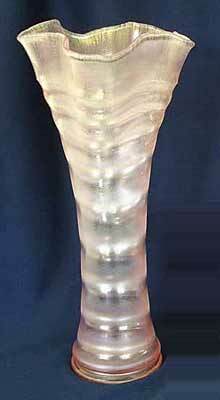 While Fenton originally designated these stretch glass vases as #1531 when they were made in the late 1920s, collectors have come to call the pattern Ring Optic. Typically, they have 3 3/4 inch bases.Both of these examples sold in 2006; the 14 1/2-inch tall example on the left in celeste blue brought $275; the pink 13 inch example sold for $165. In 2010, a 14-inch example in ice blue brought $175 and a 14 1/2-inch vase in ice green sold for $145. In 2012, a 15 1/2-inch example in ice blue brought $250. In 2013, an 18-inch celeste blue example sold for $!,000; one listed as aquamarine brought $300, and a 15 1/2-inch in tangerine sold for $375.